PWCs are fun, fast and manoeuvrable little water motorbikes that, if used responsibly, can provide endless hours of safe amusement. 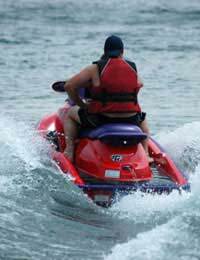 Personal Water Crafts, or PWCs, are petrol-engined, water jet propelled recreational craft that the rider sits or stands on. To put it more simply, they are motorcycles on the water. PWCs are accountable for significant number of accidents and injuries, but these largely relate to the responsibility of their rider and are not because the craft themselves are particularly dangerous. If ridden sensibly, by mature and responsible riders, then PWCs are no more dangerous than any other high performance boat. However, if they're let loose in the hands of an untrained rider with little or no interest in boating regulations and self-preservation, they can prove dangerous both to the riders and anyone unfortunate enough to get in their way. Before heading out onto the water, it is standard procedure with all sea-based watersports to first check the shipping or local radio weather forecast as well as the tide times. Also somebody ashore should be informed of the rider whereabouts and expected time of return. One essential piece of gear for all riders is the personal floatation device (PFD). It is also recommended that riders wear gloves, goggles, protective footwear and either a wetsuit or a dry suit. The second essential thing to take along for the ride is another person with another PWC. This is not only to make the experience more fun but also if one rider gets into trouble then the other is there to help. The condition of the PWC itself should be checked, paying particular attention to how well the power unit has been maintained. It is also important to make sure there is enough fresh fuel and oil for the intended trip. PWCs are noisy and unruly beasts that are rarely welcomed with open arms by other water users and so to keep everybody happy and feeling safe it is important to follow all local rules and regulations. PWC riders should check information notices at access points, observe local speed limits and use buoyed channels and designated zones. There may, for instance, be areas designated for bathers, water skiers or windsurfers, and who don’t want the added excitement of PWCs speeding past them. Riders should also keep a keen eye on other craft, remembering to signal to those in close proximity when slowing down or turning and bearing in mind that PWCs don’t have brakes and so can take a long time to slow down. Falling into the water is a fairly common occurrence, especially for those who like their high-speed turns and wave-jumping, and so PWC users should all be competent swimmers and more than happy to spend periods of time floating in the cold water wearing a PFD. All modern PWCs are also equipped with emergency shutdown devices that either cut off the motor or put the machine into low-speed idle when the rider takes a tumble. PWCs are not only designed to accommodate lost passengers but are able to endure a complete rollover without too much hassle. The mechanical problems usually associated with such a feat are not a problem for PWCs, which have sealed motor compartments and a convoluted air inlet that traps and dispels any water. This clever system only works however if the machine is rolled upright in the indicated direction. The best way to learn how to use a PWC safely and confidently is to enrol in the one day Royal Yachting Association-approved (RYA) Personal Watercraft course. This is taught at RYA recognised training centres across the UK and all new UK PWCs are sold with a voucher towards its cost. The course teaches beginners and experienced riders alike such important aspects as how to used a PWC safely, responsibly and with confidence. It also covers high and low speed riding skills, essential safety information, collision avoidance and orientation at sea.